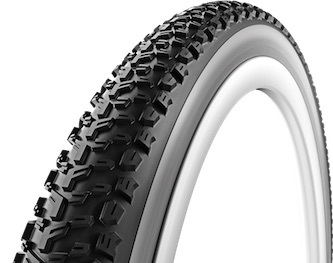 Mountain bike tires are often optimised for grip by employing soft rubber compounds in their construction. This is great for trails, but not necessarily your highest priority if you’re on an epic bike journey. Luckily for the adventurers out there, there are a handful of bikepacking tires that are optimised for durability, intentionally or not – which I’ll be covering in this resource. I asked the highest-mileage riders I know (ultra racers and round-the-world adventurers) which bikepacking tyres they reliably use for months at a time. The same few tires were recommended over and over, suggesting that there is somewhat of a consensus here. The tires I will be recommending have been known to last upwards of 8000km/5000mi, and as much as 25000km/15000mi. Maxxis undoubtedly has the best reputation for making the most-durable, high mileage tires, in particular, their models with the EXO casing. The tires by Continental that feature their ‘ProTection’ label are also exceptional. Schwalbe off-road tires commonly prioritise grip rather than durability, but a few of their touring models work out well for dirt roads. Vittoria makes a few super fast-rolling models that folks are getting great mileage out of, and they come in the new 29 x 2.60″ size too. But first, let’s start with some general tire info. Sarah Hammond is the 3x Race to the Rock winner and has NEVER had a puncture on her Maxxis Ikon tires mounted to Curve carbon rims. Not even when out training for her ultra races! If speed is your aim, stop thinking about how to shave a kilogram off your kit and start looking at fast tires. Rolling resistance plays a big role in your cycling speed because no matter what speed you ride, it’s a consistent force that you need to overcome (unlike air resistance which increases with speed). The speed difference between slow and fast rolling tires is very significant – a slow rolling set of tires will tax you 90 watts, while a fast set will take as little 46 watts. If you’re putting 150 watts into the pedals, 40-something watts is a large percentage of your effort to have disappearing into your tire contact patch. There is a ‘but’, however. This assumes a relatively smooth riding surface. The rougher a trail gets, the wider your tires need to be to optimise your speed. Tires in a 3.00″ width can absolutely be the fastest rolling tire option under the right conditions. I think it makes the most sense to optimise rolling resistance for the surfaces that you will be riding most. I have provided the rolling resistance data where I can (thanks to BicycleRollingResistance.com), but I’ve also estimated the resistance for other tires too. This information isn’t 100% accurate, but I have factored in many data points (width, casing, similar tires etc) to arrive at these approximate numbers. Head HERE for an in-depth look at the rolling resistance lab testing for touring tires. This tire size comparison chart by Jamis Bikes is the best I’ve seen. The fastest option is a 29-inch mountain bike wheelset for most off-road terrain. With a broad range of widths (2.00 to 2.60″), you should be able to find a tire that’s both quick on dirt roads and also very capable the trails. Narrower tires tend to have the advantage on smoother surfaces while wider tires will offer additional grip and comfort (nice on a rigid bike). For rough trails, this is the option that will roll over objects with the smallest ‘angle of attack’. 29+ works out to be fastest over rocks, and with the increased tire footprint and volume, you’ll find them to be supremely grippy too. Not too many MTB bikepacking bikes are built around this wheel size, however, a growing number of drop bar gravel bikes can accommodate tires in the 27.5 x 2.00-2.40″ range. Bikes that fit these tires can often also be interchangeably used with 700 x 35-45C wheelsets too. The All City Gorilla Monsoon or Bombtrack Hook EXT-C are two bikes that come to mind. This is the most popular plus-sized option as the wheel+tire diameter works out to be the equivalent of a 29″ wheel. As a result, you can have one bike that will fit two different wheelsets, allowing you to perfectly optimise your tires for your intended terrain. A decade ago, the standard size for bike travel was 26 inch. There are still a few 26″ touring bikes getting about, but they’re becoming less common by the year (the 2019 Touring Bicycle Buyer’s Guide has very few). But 26 ain’t dead – 26″ is still the most common rim diameter for fat bikes and can still be found on many XS and small bikepacking bikes. The bike pictured is Jesse Carlsson’s Curve GMX. Most ultra racers prefer the 29 x 2.20″ size because it’s fast but capable. There are a few factors affecting tire durability which need to be considered because, well, results will vary. If you’re spending more time riding on rocks, you’re simply not going to get the same mileage as on a smooth dirt road. Based on anecdotal evidence, rocky terrain can increase tyre wear by as much as 75% (eg. 2000km instead of 8000km wear life). One reason why ultra racers often get such good mileage out of their tires is that they pack light. The heavier the load on the tire, the faster the tire wears. This isn’t the best news for heavier riders, sorry! You will experience less tire wear by simply taking it easy on rough and rocky descents. Make sure to avoid locking up your rear tire whenever you can. I’ve found that by running a higher pressure than ideal (make sure not to exceed the maximum) allows for better mileage as the tire will deform less. Please note that both your speed and grip will be reduced by employing this strategy. An age-old way to get more life out of your tires is to switch the front to the rear at about 50% wear. As the rear wears faster than the front, this avoids having one very worn tire and another with thousands of kilometres of life left. Ideally, all tires would fit all rims with the same amount of ease. But this isn’t always the case; in the worst case scenarios, a tire can literally be an impossible fit. Equally, you don’t want a tire to be too loose, as this results in the tire bead being able to pop off the rim while riding. Make sure you can get your tire off the rim with the tire levers you bring on your adventures. This is particularly important if you’re racing, as your hands will often be fatigued. You can pre-stretch your tires on another rim if they seem to be too tight, or alternatively, you can fit and remove your tires a few times to stretch a couple of extra millimetres out. 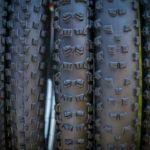 As for tubes or tubeless, the answer is undoubtedly… TUBELESS! Yes, it’s worth the hassle. A little extra sealant than recommended is worth its weight in gold too – you never know how many thorns you’ll meet on a long outing. The recommended tires below don’t all have a perfect manufacturing track record, but they are pretty damn good – I think you can be confident with them. That said, it’s worth putting some mileage on a tire before taking it into the wilderness. Sometimes you’ll find the rubber layers can deform, or the bead can separate from the sidewall. The good news is that these problems normally show themselves very early on, and any bad batch tires will be replaced under the manufacturer warranty. The Otso Voyek is a 27.5+ or 29+ trail bike that can also accommodate up to 26 x 4.6” tires! 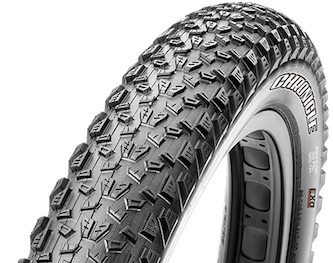 *If you want to buy any of these tires, doing it via the Amazon links give CyclingAbout a small commission which goes into creating more great resources for the bike travel community. 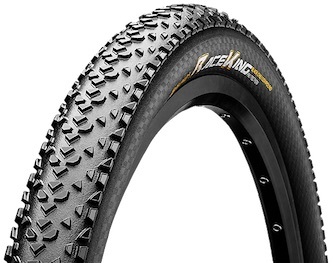 The RaceKing ProTection is one of the most well-known bikepacking tire options. Sets of these have been known to conquer the Tour Divide bikepacking race not once, but twice (8800km+). 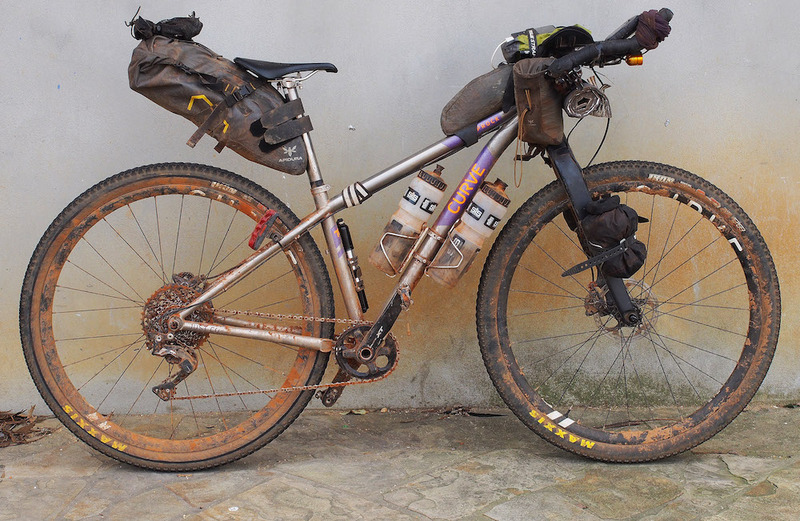 Amazingly, some dirt tourers have even exceeded 12,000km with zero punctures (although a couple of plugs were required). You’re also looking at the fastest rolling tire on the list. The Maxxis Ikon is currently a very popular option for bikepacking racing. These are known to be super-durable and easy to fit. The rolling resistance numbers may be a little bit disappointing, but given how many love the way these tires hook up on trails, they’re still a winner. The Maxxis Ardent Race is a particularly popular front tire if you’re spending time in singletrack (eg. Colorado Trail Race). These are equally as durable as the Ikons, but the extra side knobs will help dig into the terrain. The small price to pay is a 10% increase in rolling resistance. 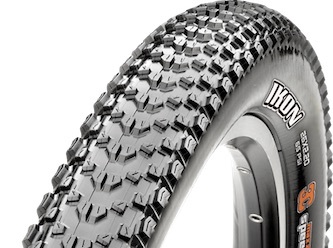 A few riders have found the Rekon to be the most durable Maxxis tire offering. You can expect more grip than the Maxxis Ikon thanks to the increased knob height, but as a result, you’ll also be getting a bit more rolling resistance. 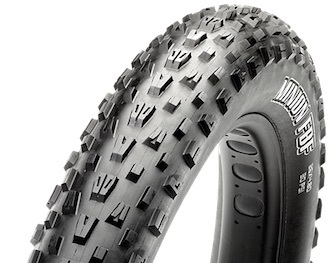 Another super popular bikepacking tire for events like the Tour Divide is the Vittoria Mezcal. These super fast-rolling tires use a graphene compound which seems to allow them to roll particularly quick, but at the same time, last the distance. 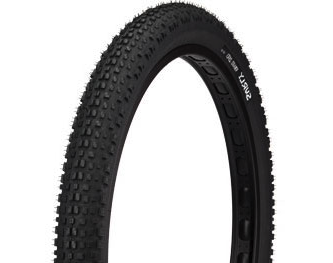 These are also one of the only durable tire options in the new 29 x 2.60″ width. While more of a touring tire, the wear-life of the Mondial is simply out-of-this-world – I clocked 25,000km on a set between Europe and Australia. There are two main downsides to the tire though. 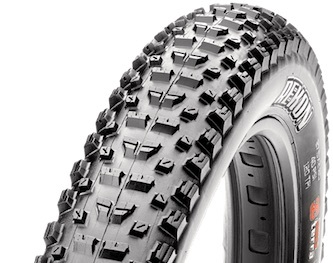 The grip is very poor on trails, and the tire is only available in a 2.00″ width. Still a great option for dirt road riding, and one of the only models that are decent with tubes. These boat anchors are the most puncture resistant bikepacking tires money can buy thanks to their thick protective layer. A continuous tread along the centre of the tire allows them to roll relatively quick on harder surfaces. I’d be confident in suggesting you can travel 10,000km+ on a set of these with zero punctures (even with tubes). The 29+ bikepacking tire of choice for most long-haul travellers is the Chronicle. It’s built super sturdy with Maxxis’ EXO protection and rolls ok thanks to its low profile knobs. It’s not the lightest, but who cares when you can beat them up for 10,000km. The Chupacabras are the lightest and fastest rolling 29+ tire option. Surprisingly, many riders are getting great mileage out of them, typically around 8000km on dirt roads. The biggest downside to the Chupacabra is the price, these are found for US $100+. The Knard was introduced along with the Surly ECR in 2014, making it the oldest 29+ tire (I think). Quite a few ECR owners have managed to clock over 8000km with these tires, making them a great option for long-distance bikepacking trips. The wire bead version is known to be the most durable. The Maxxis Ardent Race is a particularly popular front tire if you’re spending time in singletrack (eg. Colorado Trail Race). These are equally as durable as the Ikons, but the extra side knobs will help dig into the terrain. 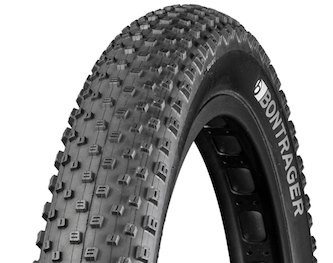 These are the 2.60″ tires of choice in this list for singletrack. This wide slick was originally designed for eBike use but they’ve also been used on many 10,000km+ trips now. You’ll find this fast-rolling rubber to be very puncture resistant thanks to the DD and GreenGuard protection layers. Unfortunately, the wire bead makes them a little heavier than most tire options, but the low rolling resistance more than makes up for it. 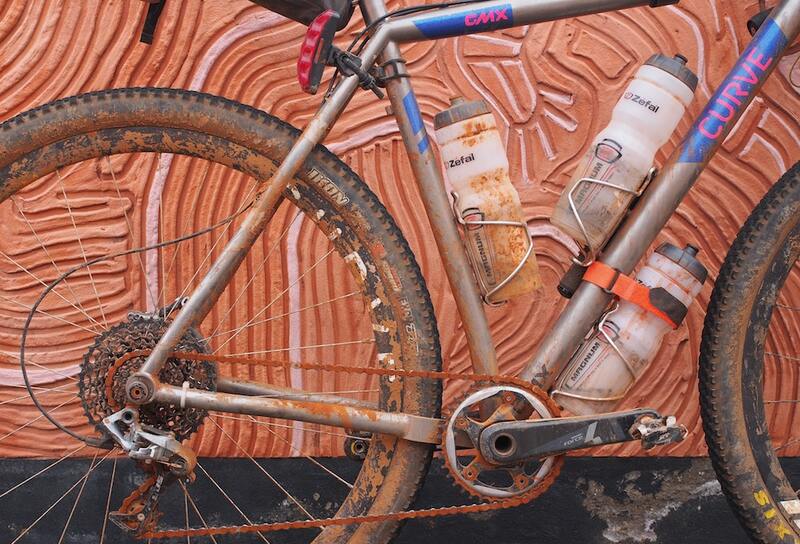 Another super popular bikepacking tire for events like the Tour Divide is the Vittoria Mezcal. These super fast-rolling tires use a graphene compound which seems to allow them to roll particularly quick, but at the same time, last the distance. 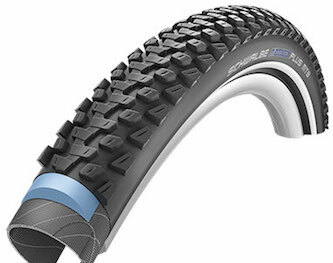 These are also one of the only durable tire options in the new 2.60″ width. The 27+ bikepacking tire of choice for most long-haul travellers is the Chronicle. It’s built super sturdy with Maxxis’ EXO protection and rolls ok thanks to its low profile knobs. It’s not the lightest, but who cares when you can beat them up for 10,000km. A touch narrower and a decent amount lighter than the Chronicle, the Ikon has recently been produced in a larger volume. While I don’t know anyone who has put high mileage on them, they’re expected to perform very well considering the outstanding track record of the regular width Ikons. The Chupacabras are the lightest and fastest rolling 27+ trail tire option. Surprisingly, many riders are getting great mileage out of them, typically around 8000km on dirt roads. The biggest downside to the Chupacabra is the price, these are found for US $100+. This wide slick was originally designed for eBike use but they’ve also been used on many 10,000km+ trips now. 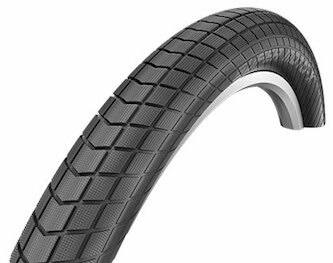 You’ll find this fast-rolling rubber to be very puncture resistant thanks to the DD and RaceGuard protection layers (5.5/6 on the Schwalbe protection scale). Unfortunately, the wire bead makes them a little heavier than most tire options, but the low rolling resistance more than makes up for it. 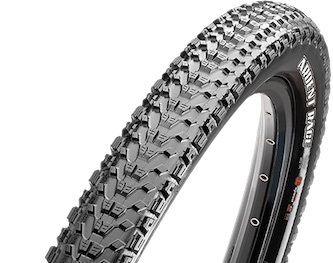 The Maxxis Minion fat bike tires have the best reputation for durability. 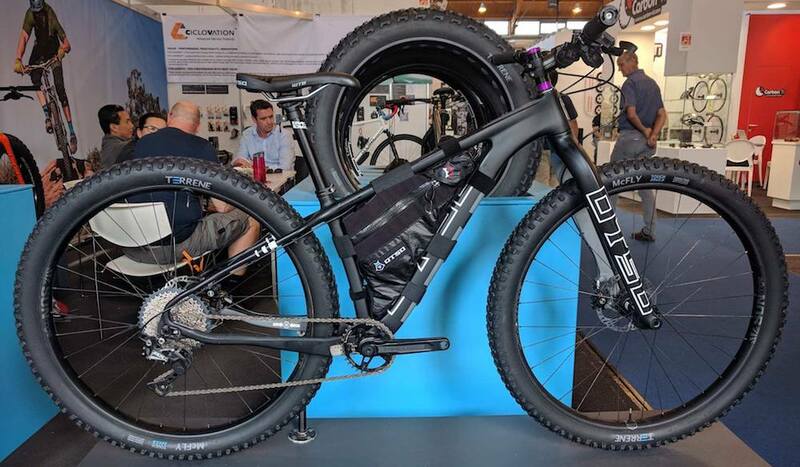 There are front (FBF) and rear (FBR) specific models to fit up, but these tires are certainly not quick rolling (not that you buy fat bike tyres for speed). 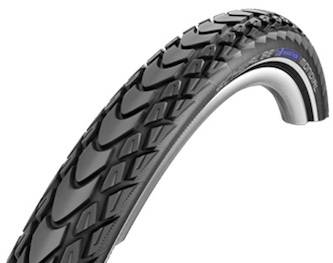 If you’re doing lots of dirt roads, a Schwalbe Jumbo Jim tire is around 20 watts faster though… per tire! Can You Recommend Any Other Long-Wearing Bikepacking Tires (8000km/5000mi+)?